Welcome one and all to the latest installment of the NXT Spotlight here at TJRWrestling. We have finally made it to Takeover week, so this is our last episode before we head to the City of Angels for Takeover: War Games II. Only 4 matches this time around, but it’s a completely stacked card and should be fantastic. Be sure to check out our official TJRWrestling preview piece for that show. Tonight we have the man advantage on the line for War Games, and i’m sure a few surprises. So let’s get to it! Bianca pie faces Mia to start. Bianca with a hairpull that leads to a go behind takedown. Mia with a double leg takedown with a float over pin, trying to steal a win. Bianca kicks out but Mia gets her back down with a side headlock. Bianca with a chop to the back and a shoulder tackle. Mia avoids a dropkick and then delivers some knee strikes before a trio of dropkicks of her own. Make that four with a running front dropkick. Bianca to the apron but ends up dumping Mia to the floor. 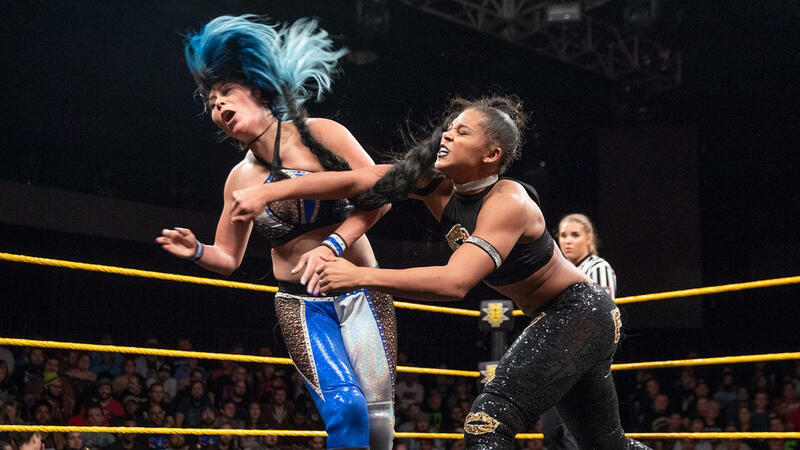 Bianca gets her back in the ring and works over the head and neck of Mia. Mia escapes and goes for some more quick pins to no avail. Bianca gets up and lands a double ax handle. Bianca works Mia over in the corner. Bianca with a disrespectful cover of one foot on the throat and Mia kicks out at one. Bianca is now mocking Mia until Mia with another takedown. Bianca gets back up and lands another dropkick. Mia kicks out of another pin. Bianca back to the neck. Bianca misses a legdrop and then catches a back elbow. Mia gives Bianca a drop toe hold into the turnbuckles. Mia with a couple clotheslines and a dropkick. Gutwrench suplex for a two count by Mia. The crowd was DEAD for this match but now start dueling chants for a few seconds. Mia comes off the ropes but Bianca catches her with a spinebuster for a two count. Shouder thrusts in the corner by Bianca. Mia comes back in the opposite corner with a nice striking combination, finished with a Pele kick, for a two count. Cannonball in the corner by Mia. Mia wants Sole Food but Bianca with a big forearm strike, grabs Mia in the Burning Hammer to which Nigel says is called the KOD for Bianca, and that gets the 3 count. K-Tank’s Take: That was…. not good. For the time alloted, I would’ve expected a much better match for these two. I was a really big fan of Bianca when she first arrived, but now I’ve soured on her a bit. I feel like she’s trying too hard. She’s still new, so maybe she’s still trying to find herself. She’s just a bit over the top for me. We go backstage with Ricochet, War Raiders, & Pete Dunne, who are asked who is taking on Kyle O’Reilly tonight. Dunne and Ricochet argue who it should be, and War Raiders finally cut them off and say it’ll be Hanson doing it. Now we go to Matt Riddle backstage, who is asked about how his time at NXT has been. He says it’s been great and no one is ready for the Bro. Kassius Ohno crashes the interview and asks what Riddle’s malfunction is. He’s been waiting to hear that Riddle has challenged him, but nothing. When Ohno came back to NXT, he challenged the likes of Nakamura and Roode. So he’s starting to see through the Bro Show and all the hype and thinks it’s all trash. Riddle says next week he’ll take Ohno’s little test, pass that test, and oh no, he’ll leave Kassius lying in the ring. What’s he gonna do about that, Bro? Kassius leaves in a huff. Riddle says he’s used to stuff like that all the time, but he’s glad they talked because now they can fight. Lacey with a knee to the midsection and then a drop toe hold. Then she does pushups on top of Karissa. Lacey drives Karissa’s head into the turnbuckles, and then comes down with her springboard bronco buster. Karissa tries to fight back with a series of chops and then a dropkick. She goes for a cover but Lacey out at one. Lacey is upset now and repeatedly drives the face of Karissa into the mat. Karissa gets up but Lacey delivers the Woman’s Right for the win. Post match, Lacey gets a mic and says that NXT is full of classless nasties. These girls forget what it means to carry themselves with sophistication. She will lead by example though, since that’s her responsibility as the Lady of NXT. If they don’t adhere to her standards, then she will teach them some class with the Women’s Right. K-Tank’s Take: Between Lacey and Bianca, both women seem primed for a title shot in the very near future. Which leads me to my prediction for the NXT Women’s title match at Takeover. We get a preview of the NXT Title Match between Tommaso Ciampa and Velveteen Dream. After that is a preview of the NXT Women’s title match between Kairi Sane and Shayna Baszler. 14 minutes left in the show as the bell rings. O’Reilly repeatedly getting some shots to the face of Hanson, which just angers the big man. Hanson ends up running over O’Reilly and sends him to the floor to regroup. O’Reilly gets back in and tries a seated attack that he’s known for, but he can’t get Hanson off his feet. O’Reilly tries a headlock but Hanson just overpowers him. Hanson once again runs over O’Reilly as he comes off the ropes. Big clotheslines in the corner by Hanson and then he props O’Reilly up on the top turnbuckle and does the 10 Beats on O’Reilly’s chest. O’Reilly ends up just dumping down to the floor. Hanson throws him back in but O’Reilly is able to chop the knee of Hanson as he’s getting in and finally has the advantage. O’Reilly with repeated attacks on the now injured knee. Hanson throws O’Reilly to the floor and then O’Reilly comes back in, only to be caught in a bodyslam. Hanson with a big splash but O’Reilly moves. O’Reilly escapes a back suplex and chop blocks the opposite leg now. O’Reilly with a dragonscrew leg whip. Hanson trying to fight out of the corner but O’Reilly takes him down easily and hooks a knee lock. Hanson doing what he can to escape and lands a stiff boot right to O’Reilly’s face. Both men up and Hanson back body drops O’Reilly. Hanson with multiple strikes and then a modified sidewalk slam. Seated cross body by Hanson. Avalanche splash in the corner, followed by a spinning slam for a close two count. Both men trading blows now. Hanson with a big boot that sends O’Reilly to the floor. Hanson now with a massive dive through the ropes to take out O’Reilly. Hanson with a running bronco buster in the corner and now goes to the second rope. Adam Cole shows up for the distraction though. Hanson ignores the distraction, but takes too long and attempts a top rope moonsault, but O’Reilly moves. O’Reilly then goes to the Ankle Lock on Hanson. Hanson is able to grab the ropes. The ref is talking to O’Reilly about not breaking the hold, which allows Cole to kick Hanson in the head. O’Reilly follows with a stomp to the back of the head and a forearm strike, but Hanson still kicks out at two. Cole on the apron in anger, but here comes Rowe to take him out. O’Reilly catches a knee to the face but still comes back with big kicks. Hanson cartwheels out of the way of one and then lands a lariat. Both men down while Rowe throws Cole into the steel steps. Here comes Roddy Strong and Bobby Fish to take out Rowe. Pete Dunne stomps down and he’s attacking everyone until Fish chop blocks the knee. Ricochet comes out of nowhere from the ring and does a somersault dive that takes out everyone on the floor. In the midst of the chaos though, O’Reilly grabs his tag title and hits Hanson in the back of the head. The ref doesn’t see it, which leads to O’Reilly getting the win and Undisputed Era have the advantage at War Games. Post match, Dunne and Hanson both selling their knee injuries, Dunne more so than Hanson, as our show comes to an end. K-Tank’s Take: Really good match for these two. O’Reilly is one of the most believable workers in the business and Hanson is one of the best moving big men, maybe in history. I think a lot of people sleep on how good he moves in the ring. Undisputed Era winning was the least surprising thing that could happen here, but that’s kind of the charm of War Games. That’s it for this week. Be sure to check out our Takeover preview and then join me live on Saturday night for coverage of the event. Until next time, don’t do anything I wouldn’t do, but if you do… name it after me!